Magnetic data is easy to come by on the surface of the Earth. It is relatively cheap to measure the magnetic anomaly using light aircrafts or drones, and susceptibility meters can be bundled along with gravity meters for additional prudence. Anomalies are assumed to reside on a horizontal surface at an elevation $z_t$ above magnetic sources. As magnetite is the most magnetic mineral, the Curie depth is often interpreted to be the Curie point of magnetite - approximately 580C. Curie depth thus offers a very desirable isotherm in the lower crust. Gradient-based minimisation quickly converges to a model of minimum misfit between $\phi_d$ and $\phi_m$. Finite-difference updates to the Jacobian are feasible here since number of points in $\phi_d$ greatly outweights our four unknowns, thus the problem is well-posed; but this remains a unique solution in a very nonunique problem. $\beta$ exterts a much larger sensitivity to the shape of $\phi_m$ in the low frequency domain than $\Delta z$. Ensure there is no a priori information and commence with suitable starting values for $\beta, z_t, \Delta z$. Take the median and standard deviation of all parameters and add them as priors within the misfit function, then run the optimisation again. A sensitivity analysis is essential to gauge the amount of uncertainty in a Curie depth determination, given the highly non-unique nature of this inverse problem. We randomly perturb each of $\beta, z_t, \Delta z$ within their prior distributions and build an ensemble of Curie depth realisations. We can query the posterior for various quantities, such as the median and variance, and extract covariance information to quantify the variation of Curie depth with statistical rigour. 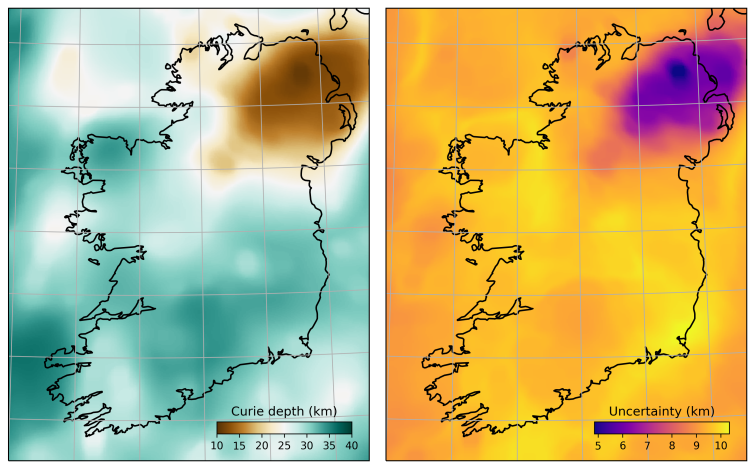 Above is the Curie depth we calculated across Ireland using the EMAG2 global magnetic anomaly compilation. Download PyCurious and try the code out for yourself.